Splinter Cell Chaos Theory v.1.04 (Ubisoft) - DirectX 9.0, shaders 3.0 (with HDR), maximum settings. CRYSIS (demo) (Crytek/EA), DirectX 9.0c/10.0, shaders 3.0/4.0, (batch file to start the test), test settings in MS Windows Vista - Very High (DX10), Windows XP - High (DX9)). PREY 1.3 (3D Realms Entertainment / Human Head Studios / 2K Games) - OpenGL, shaders 2.x, demo003 (40MB!). Tests were run with maximum quality. The batch file is included. Serious Sam II 1.068 (Croteam/2K Games) - DirectX 9.0, shaders 3.0 (with HDR), batch file to start the test. It's the standard demo0002 that comes with the game. Tests settings - maximum. 3DMark06 1.10 (FutureMark) - DirectX 9.0c, multitexturing, trilinear test settings. 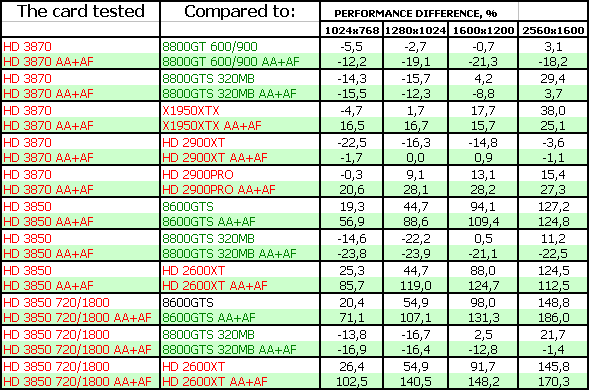 RightMark3D (iXBT.com) - DirectX, synthetic benchmark, Shader 2.0/2.0b/3.0, you can download it here. First of all, you should look through our reference materials on modern graphics cards and their GPUs. Be sure to note the operating frequencies, support for modern technologies (shaders), as well as the pipeline architecture. 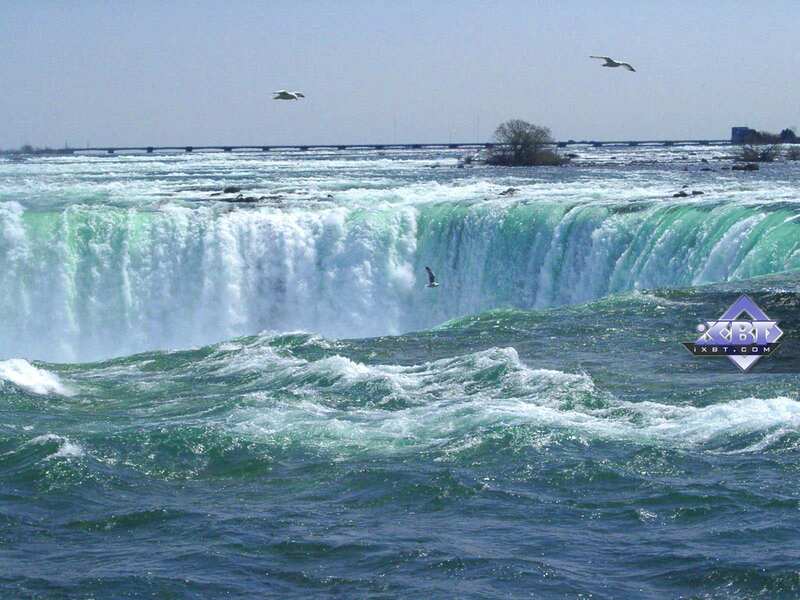 You should understand that the 8800 family of accelerators abolished the notion of a pipeline. These cards have streaming processors, which process shader commands in a game. Texture units process pixels (applying textures, filtering) by themselves, that is the processes are fully divided. 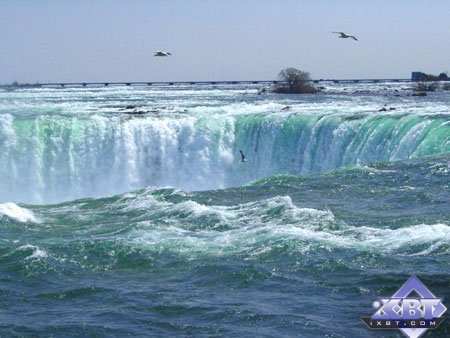 Data are written into a memory buffer, as always, only after texture operations. The old procedure was to take a triangle, calculate it with shader commands, apply texture(s), filter it, and send it along; that's not the case now. It's up to a driver and a thread processor to distribute tasks between stream processors. The same with texture units. 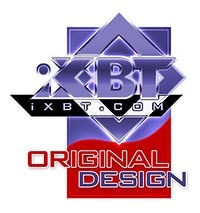 If you have just begun realizing how large the selection to choose a video card is, don't worry, our 3D Graphics section offers articles about 3D basics (you will still have to understand them - when you run a game and open its options, you'll see such notions as textures, lighting, etc) as well as new product reviews. There are presently two companies that manufacture popular GPUs: AMD (its ATI department is responsible for graphics cards) and NVIDIA. We can also mention Matrox, S3. However, their share of the discrete graphics market is less than 1%, so we can discard them. So most of the information is divided into these two sections. 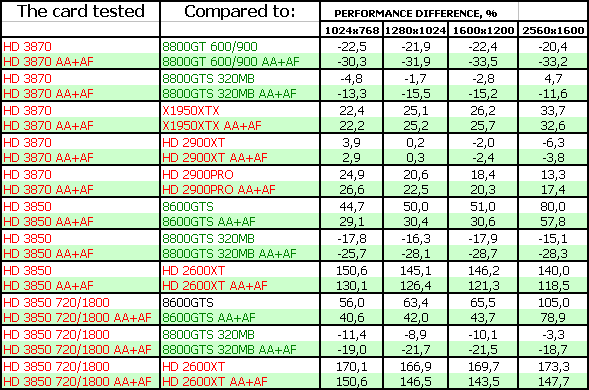 We also publish monthly 3Digests that sum up all comparisons of graphics cards for various price segments. 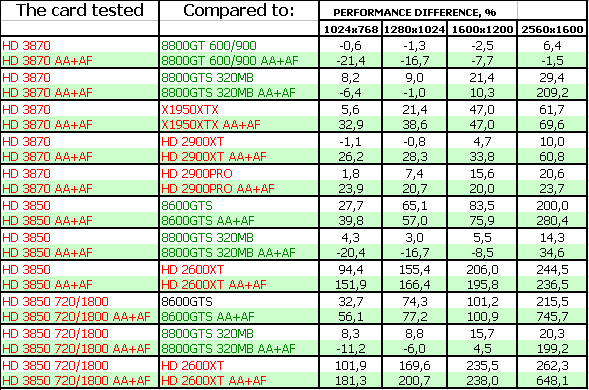 The February 2007 issue analyzed dependence of modern graphics cards on processors without antialiasing and anisotropic filtering. The March 2007 issue did the same with AA and AF. Thirdly, have a look at the test results. We haven't analyzed each test, because test results are more or less even (for rare exceptions). ATI RADEON 3850 (RV670) 256MB PCI-E is generally a very good product compared to the GeForce 8600 GTS! But it's more expensive. NVIDIA does not have a graphics card to compete with ATI in this very price segment - $150-$180. 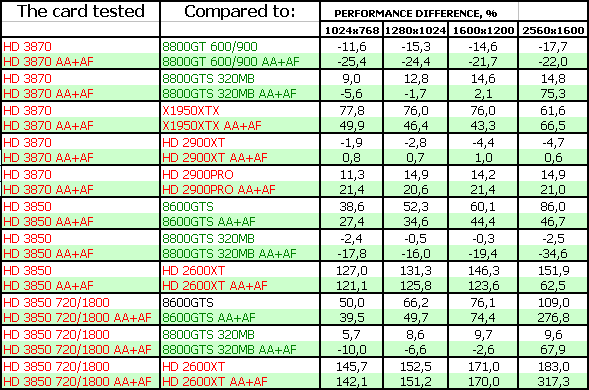 The 8600GTS is cheaper, the 8800GTS 320MB is much more expensive as well as the 8800GT. There are some drawbacks here: AMD still follows the policy of cutting down texture units and implementing AA via shader processors. So there are big performance drops, when AA is enabled. Besides, the new cards slow down in games that require high texturing performance. The overheating problem is easily solved by raising fan speed using RivaTuner. Besides, future drivers will certainly use higher rotational speed by default (the driver can also control the cooling system). In fact, the card is very good for its price. It's small, efficient, and quiet. 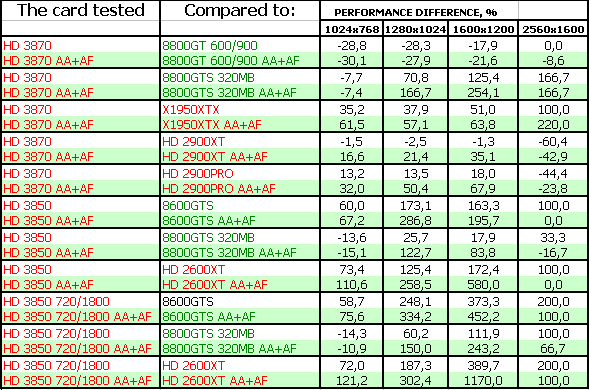 What concerns the PowerColor card, 512 MB of memory has a positive effect on a number of tests. But it's important mostly in those resolutions, where gameplay is below acceptable. 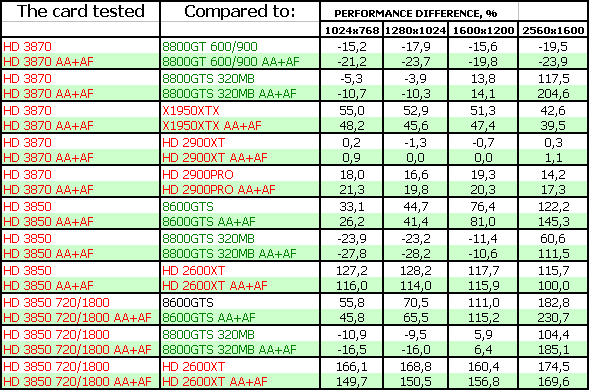 Increased frequencies have a much stronger effect on performance, they raise this card almost to the level of the 3870. Yep, the cooling system is a tad noisy and large (it takes up two slots), and the hot air is not thrown out of a system unit. But this problem cannot belittle all advantages of this product. Unfortunately, you'll have to put up with insignificant noise, the cooler cannot be controlled. Pay special attention to this - the card is equipped with an HDMI port. What concerns me, I don't like it, because DVI-to-HDMI adapters are quite well spread, and all companies can include them into the bundles. On the other hand, a single DVI makes it impossible to use this graphics card with two monitors. HDMI transfers data in digital format, so it does not matter whether you use an adapter or the stream goes straight from the card. It's not an analog connection, where each extra section may deteriorate the resulting quality. ATI RADEON 3870 (RV670) 512MB PCI-E is a ambiguous product. On one hand, it's slower than the 8800GT (8800GTS 320MB is already discontinued). 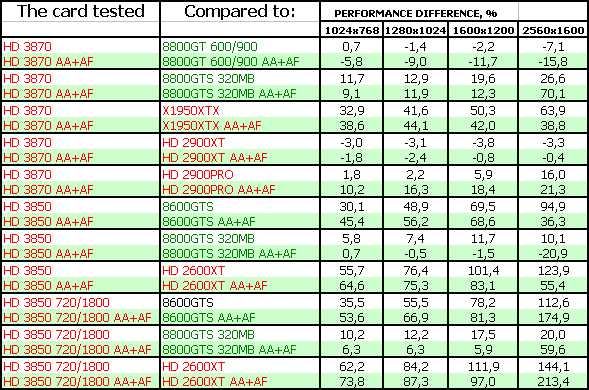 On the other hand, we know that the 8800GT is more expensive and does not support DX10.1. Besides, it's noisier and hotter, while the 3870 comes with a good cooler that throws the heat out of a system unit. Moreover, it can be controlled with RivaTuner or drivers, so you can find an optimal balance of temperature and noise. Even if you don't change the default fan settings, the core will get 90°C, but the heat will be channeled out of a system unit. So the price will determine whether our conclusions are positive or negative. 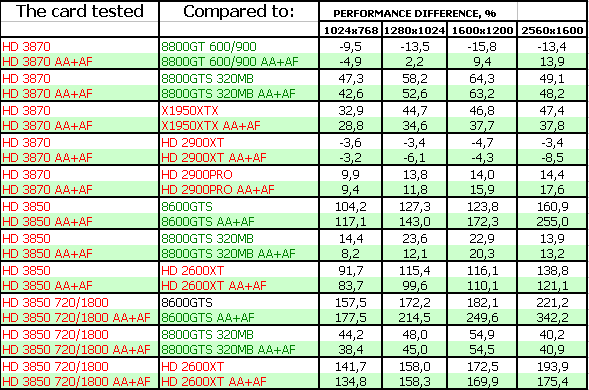 At the end of November 2007, the HD 3870 was a better choice (because of the price), since the 8800GT was not available and quite expensive at that. What concerns the 3870 cards from HIS and Sapphire, they are reference cards. So you should choose a cheaper product with a good bundle. 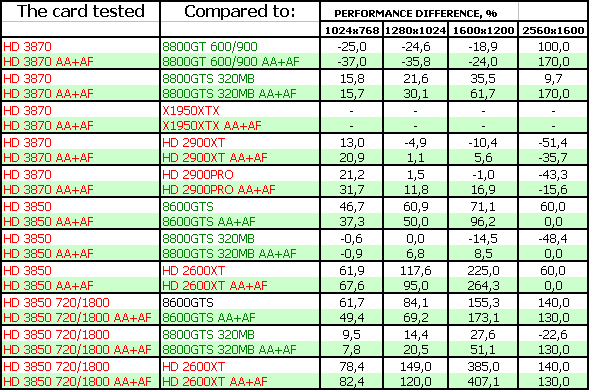 We should inform our readers that the first lots of the 3870 cards will be based on the reference design. That is they will all be identical, manufactured at third-party plants by AMD's orders. Partners just buy ready cards. All 3850 cards are now of the reference design as well. Big manufacturers will get the rights to make such cards on their own in a couple of months (both 3850 and 3870). We don't know whether AMD partners will take this opportunity. 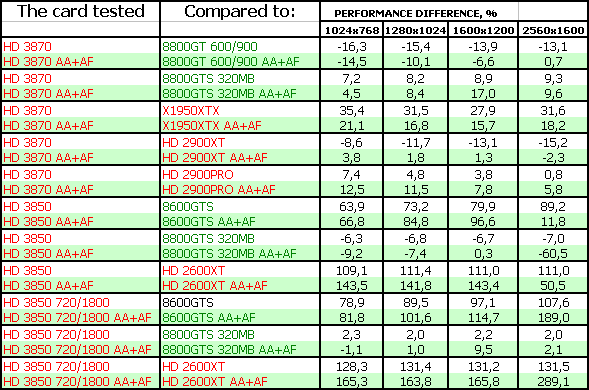 But you should compare the exterior and cooling systems of graphics cards with the photos published in this review. We can see that the PowerColor RADEON HD 3850 Extreme 512MB PCI-E is actually manufactured by the company (AMD does not add HDMI ports). 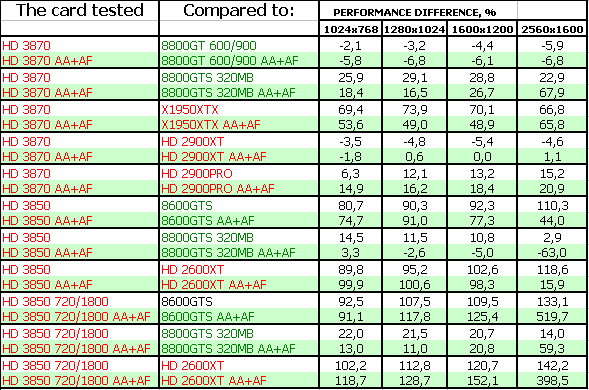 To find more information regarding the current graphics card market and the performance of various cards, feel free to read our monthly special i3DSpeed (3Digest).